The Russian Chess Federation website reports Andrei Kharov, GM, Honored Master of Sports of the Republic of Tatarstan (20.11.1968-15.06.2014), has passed away. Andrei Kharlov was born in Prokopyevsk, a city in Kemerovo Oblast. His coach was a famous theorist Evgeny Sveshnikov. In 1992, he received the title of Grandmaster after tying for first place in the 1990 Russian National Championships. Kharlov has won the 1996 Eurocup and the 1998 Russian Club Cup with the Kazan chess team. In 2000, he tied for first in the Russian National Championship in Samara and tied for first in the European Individual Chess Championship in Saint-Vincent. He participated in the FIDE World Chess Championship 2000, where he was knocked out by Veselin Topalov in the second round. In the FIDE World Chess Championship 2004 he advanced to the fifth round (final eight), but was again knocked out by Topalov. In 2005 he ended shared first in the Aeroflot Open, only to lose the title on tie-break. Since 1985 he alsostarted a coaching career. He was Garry Kasparov's second in the world title match in 2000. Since 2007 he was coaching at grandmaster school in Tolyatti. Last time he played at the competition was in Kazan at Nezhmetdinov Memorial. He finished 47th. The photo you can see was taken by Salman Shaidullin on Round 2 of the competition. Check out Kharlov's games played recently in Kazan. The cause of death is not mentioned. Croatian championship has finished in Porec. 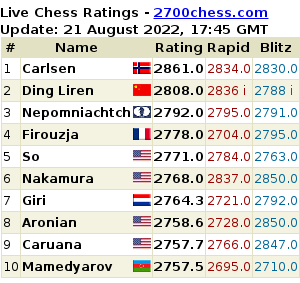 12 grandmasters determined the champion in a round-robin. The rating favourite Ivan Saric finished first. Round 2 of the 5th stage of the Women's Grand Prix taking place in Lopota, Georgia brought only two decisive games. Harika Dronavali defeated Alexandra Kosteniuk as black, while Hou Yifan beat Bela Khotenashvili. 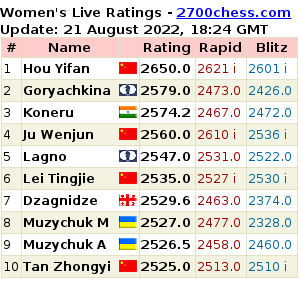 Thus, the Chinese player is leading the field with 2/2. Fressinet (8) faced Bacrot (7) in the last round of the French championship. The line of the Spanish game took place in the encounter, a calm draw assured the title for Laurent Fressinet who wins the championship for the second time in career. Earlier he has become the champion in 2010.